ST. PETER, of the noble family of Nolasco, was born in Languedoc, France about 1189. At the age of twenty-five he took a vow of chastity, and made over his vast estates to the Church. Some time after, he conceived the idea of establishing an order for the redemption of captives. The divine will was soon manifested. The Blessed Virgin appeared on the same night to Peter, to Raymund of Pennafort, his confessor, and to James, King of Arragon, his ward, and bade them prosecute without fear their holy designs. After great opposition, the Order was solemnly established, and approved by Gregory IX., under the name of Our Lady of Mercy. 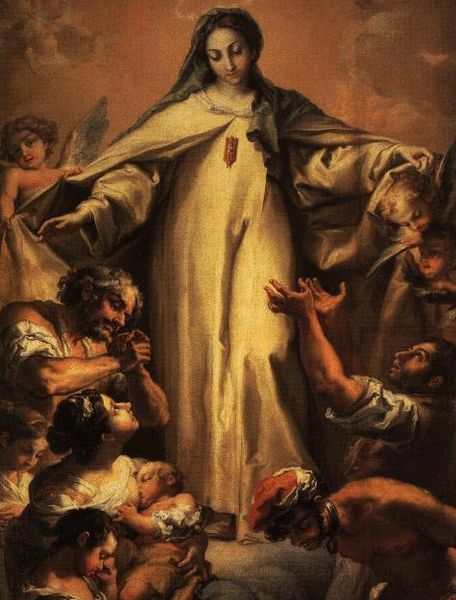 By the grace of God, and under the protection of His Virgin Mother, the Order spread rapidly, its growth being increased by the charity and piety of its members, who devoted themselves not only to collecting alms for the ransom of the Christians, but even gave themselves up to voluntary slavery to aid the good work. It is to return thanks to God and the Blessed Virgin that a feast was instituted which was observed in the Order of Mercy, then in Spain and France, and at last extended to the whole Church by Innocent XII., and the 24th of September named as the day on which it is to be observed.